$4 billion in election dollars. Where does it go? Rev. Romal J. Tune wrote this article on the Huffington Post saying that "close to $4 billion will be spent during the mid-term elections on ads and millions more on other campaign expenses." That's $4 billion or more every two years! Every election cycle! Instead of expecting the politicians and state and federal government to do something to help us pay to improve learning opportunities and create mentoring/tutoring programs in non-school hours, why not try to motivate the people who get this $4 billion to become our supporters? If you're on the receiving end of this election spending, will you join my non profit! 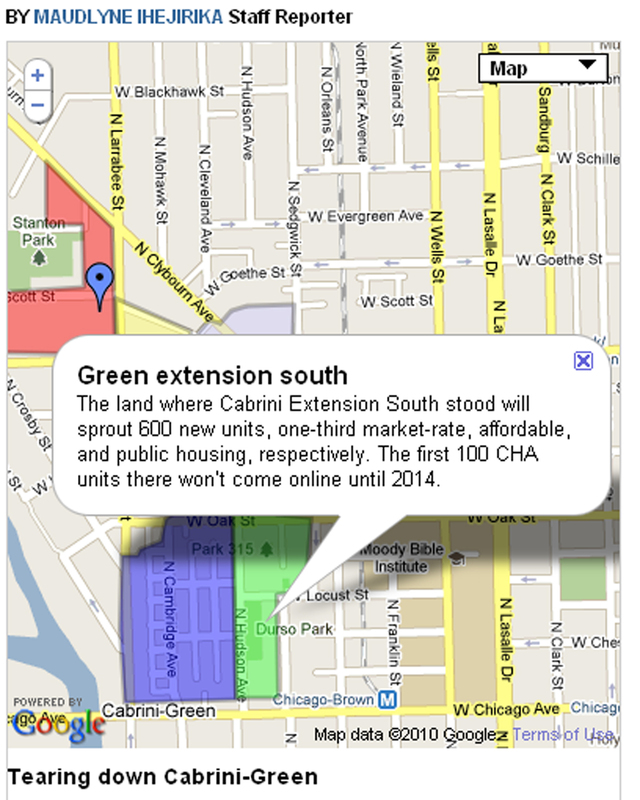 Cabrini-Green Gone? Are you sure? I agreed to reach out to alumni of Cabrini Connections for some people that he might talk to, but also challenged the reporter to dig deeper. I dug up the article myself and found that it had a really informative map. I encourage you to take a look at these. 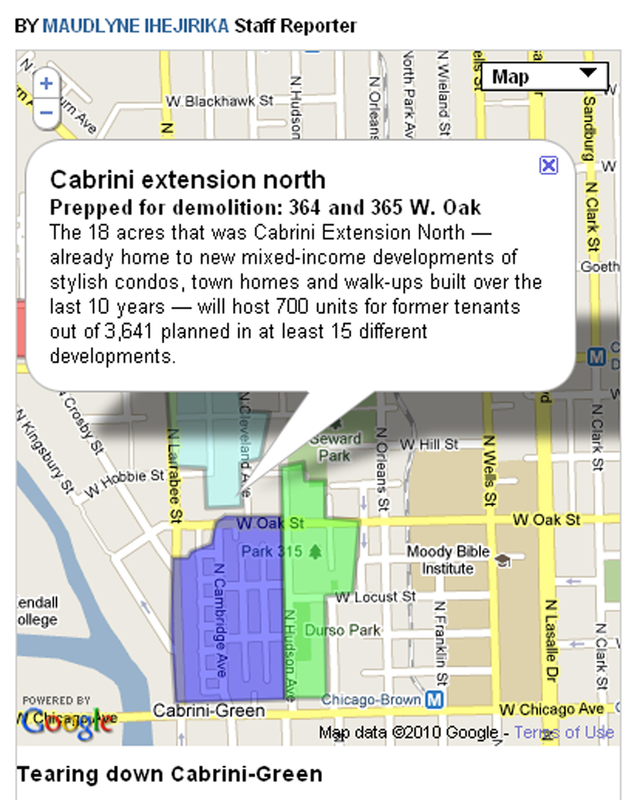 The first map shows the entire Cabrini-Green area. 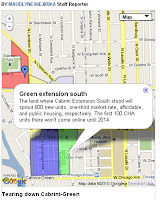 You can see an icon showing the location of the final high rise that was the focus of the SunTimes article. 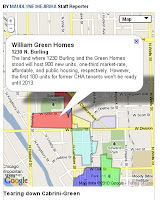 If you click into the shaded sections you will get a pop up window, providing an estimate of the number of new units being built, and the number being set aside for public housing. This is the section of two story buildings known as the "row houses". 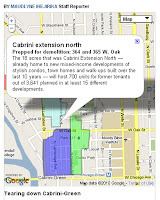 According to this article, "Only the 54 buildings of the row houses -- 586 units built in 1942 in the area between Chicago, Hudson, Larrabee and Oak -- are to remain at Cabrini. Eerily empty, a third are boarded up for rehab promised but now uncertain, as CHA reconsiders keeping this section 100 percent public housing." Do the math. If 2/3 (390) of the row house unites are occupied and there are an average of 3 kids per family, that means about 1200 kids are living in that area. If 40% are 7th -12th grade, that means there are 480 who might benefit from a program like Cabrini Connections. We only have capacity for 80. 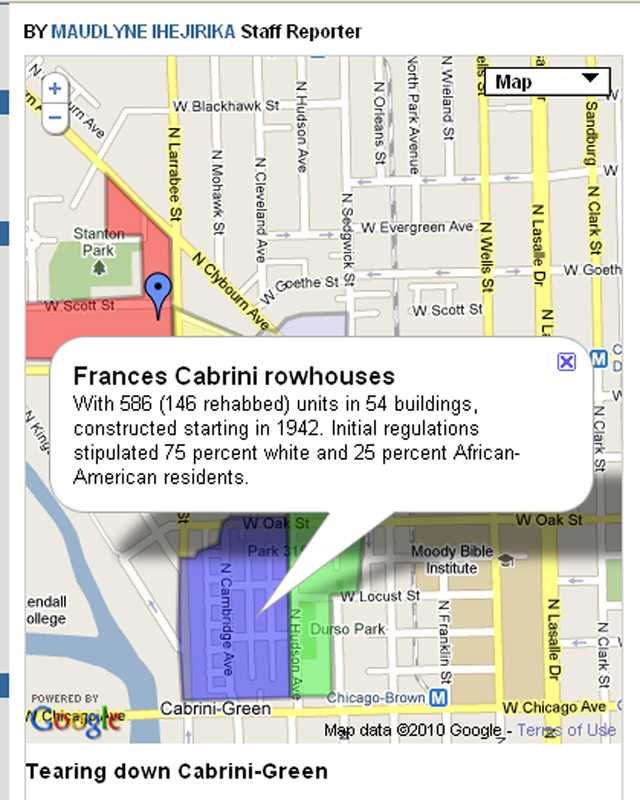 This is the Cabrini-North area. It "will host 700 units for former tenants out of 3,641 planned in at least 15 different developments." This is the area called Cabrini Extension South, where "600 new units, one-third market-rate, affordable, and public housing" will be built. This is the area North of Division Street called the William Green Homes. "This area will host 900 new units, one-third market-rate, affordable, and public housing, respectively. 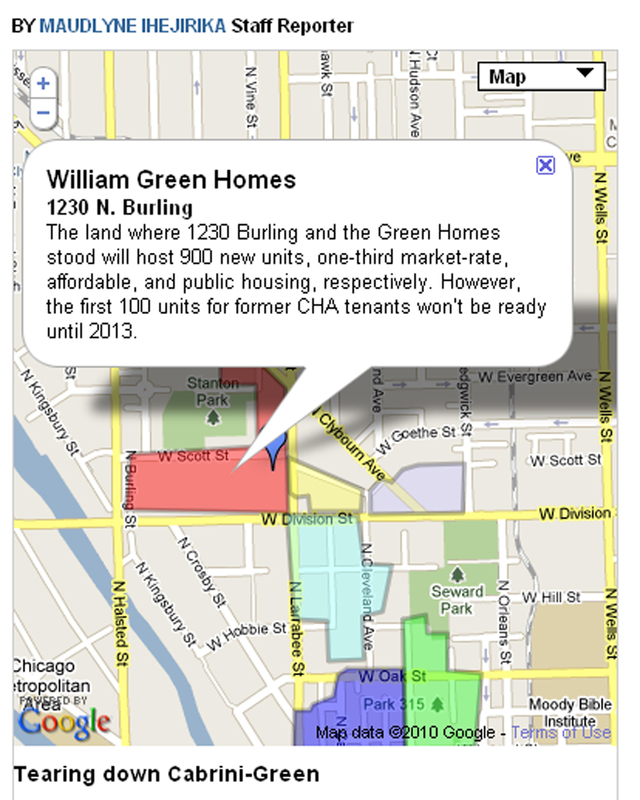 However, the first 100 units for former CHA tenants won’t be ready until 2013." The Sun Times article said, "According to CHA's FY 2010 annual report to HUD, when Cabrini's transformation is complete, it will boast 5,141 privately developed, mixed-income units -- 1,200 as public housing, 932 for working-class families, and 3,009 for sale or rental at market rates." Do the math. If there are an average of 3 kids per family, there will be 3600 low-income kids living in the public housing units in the "new" Cabrini Green. If the public thinks those kids are going to magically turn into high achievers, and their parents are going to be able to find well-paying jobs to support the education of their kids, they are not going to see any reason for tutor/mentor programs like Cabrini Connections to be in the area, and we won't be able to find the funds to continue to operate. But the people building these projects are not educators, or social workers. Are the people who purchase the market rate properties, or the "working class family" properties, going to launch programs to connect the kids in the public housing units with mentors and learning resources that are available to their own kids? Cabrini Connections has a history dating back to 1965 and operates a mentor-rich program (although poorly funded). When people in Cabrini Green realize there needs to be programs like this will they start from scratch and try to relearn all that we've learned over 45 years? Take a look at the Cabrini Connections web site and meet our teens. We have nearly 80 7th to 12th grade student enrolled in the 2010-11 program. 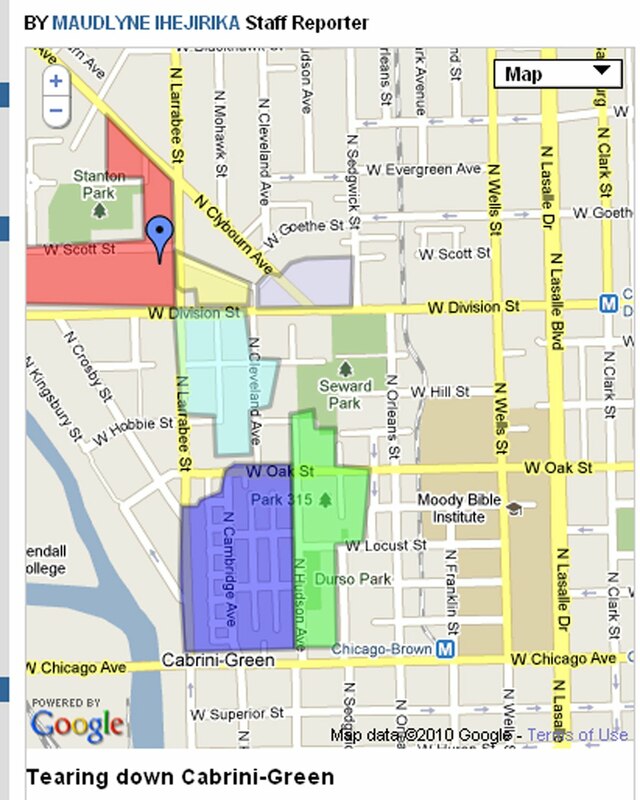 Most come from the Cabrini Green area. It will be six years before the 7th graders are high school graduates. I graduated from the program back in 1992 and I'm troubled to hear that it is in financial peril and there is the real possibility that it can close. This program was a key factor in my finally seeing what possibilities lay out there for me to be successful.... They are currently doing that for so many of the Children of Cabrini and I'm not aware of many programs that do it in a grass root, no nonsense kind of a way. I am throwing out a challenge. I will match donations to the program up to a total of $600. I wish I could do more. But unfortunately, I can't. However together, we can turn each others dollars into a significant amount. Facebook me if you want to join this challenge with me. If all goes well, we should be able to give the program at least $1200 dollars that they do not have right now and desperately need. We hope many people will respond to this challenge so we can try to help them reach this goal and be prepared for the next step to college and a career. With a good job, and a good education, they can choose where they want to live. This week the Explore Chicago class at DePaul University has been writing about how tutor/mentor programs are funded, and the different levels of funding available to different programs. Be sure to visit the blogs of each group, who focus on different sections of Chicago. As you read these blog articles, imagine how this project could be duplicated at area high schools and other colleges. 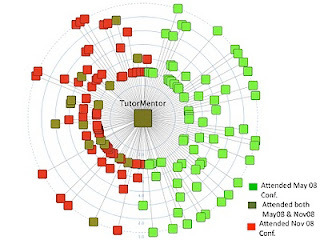 George Siemens posted this introduction of Tutor/Mentor Connection on the eLearnSpace blog. I've received email newsletters from George for many years, and many of my ideas on innovation, learning and visualization have come from people he writes about. I posted a note on George's blog encouraging people in colleges and high schools to spend time learning about T/MC, as part of service learning, and/or as a research project. Here's an article I wrote showing how that learning might lead to growing understanding and organizational involvement. As more people take ownership of these ideas we create a decentralized network of leaders all working to help mentor-rich programs connect with youth in high poverty neighborhoods. That's what is needed. New maps have been created to show the range of organizations that connected with each other through the May and November 2009 Tutor/Mentor Leadership and Networking Conference. The next conference is November 19 and will be held at U.S. Cellular Field in Chicago. Registration is open. Sponsors are needed to help pay for the costs of connecting these organizations to each other. 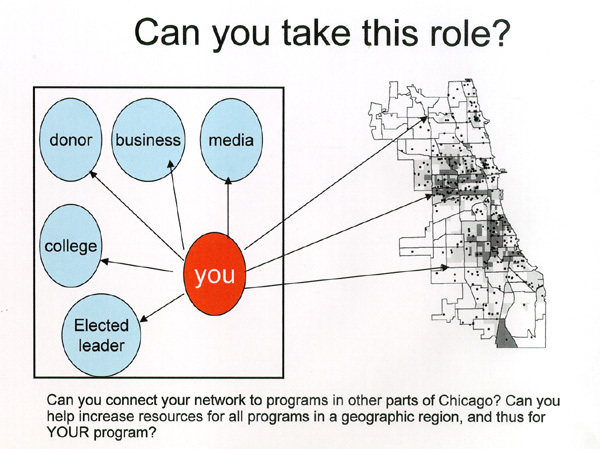 This graphic is one I use to illustrate the role many people need to take every day to draw attention and resources to tutor/mentor programs operating in high poverty areas of Chicago and other cities. Advertisers do this every day. They create messages that draw customers to places where they can buy products and services. Non profits don't have the millions of dollars that corporate, political and faith-based advertisers have. Thus, we need to motivate others who have a place in the spotlight to point to us. The Waiting For Superman movie is in the spotlight right now. On the Take Action/Get-Local page, they list 26 cities with a link to each citie. If you click on Chicago you will find nine (9) organizations listed as "top resources". 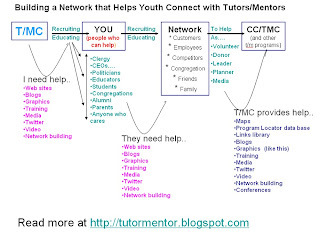 The Tutor/Mentor Connection is one of these, meaning people can go through our web site and find links to more than 200 youth serving organizations that offer various forms of tutoring and/or mentoring. Thus, the Superman Movie is encouraging people in the Chicago region to learn where and how they can become involved in tutor/mentor programs. In fourteen other cities (Boston, Detroit, Memphis, Miami, Minneapolis, New York City, Newark, Philadelphia, Phoenix, Pittsburgh, Portland, Sacramento, Seattle) there is a link to a mentoring partnership, or an organization that focuses on mentoring. 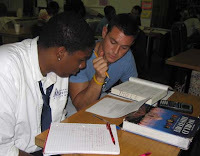 In the other 12 cities (Atlanta*, Columbus, Dallas, Denver, Houston, Los Angeles,, Nashville, New Orleans, San Francisco, Santa Fe, St. Louis, Washington D.C.**) there may be mentoring partnerships, but they are not listed, so the movie is not directly helping youth and volunteers connect in tutor/mentor programs. *Atlanta does have the Boys and Girls Clubs listed and Washington, D.C. has MENTOR listed, which is the National Mentoring Partnership, and the lead organization that made sure Tutor/Mentor Connection and other mentoring partnerships were added to the Superman site. What I'm pointing out is a) it's great that while the movie is gaining public attention, it is pointing to resources in 14 cities that are working to build strong mentoring programs. In Chicago we expand that focus to tutoring and/or mentoring. However, when this movie dies down, who will be pointing to these programs? How many of the people running for Congress or Senate or local Governors have a link on their web site, saying "volunteer or donate to a tutor/mentor program in my district" pointing to one of the intermediary organizations that aggregate information and point to more of the local programs in the state? This is a state of mind. 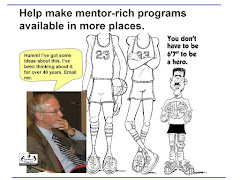 It did not cost a lot for the Waiting for Superman people to add mentoring partnerships and the Tutor/Mentor Connection to a page on their web site. This is a form of leadership that can be embraced by school children, college students, businesses, political and faith leaders. Every time we think of poverty, poorly performing schools, violence, racism, democracy, etc. someone should point to web sites with lists of volunteer-based tutor/mentor programs and encourage followers to get involved. If enough people do this every day, we can be super heroes to kids who live in neighborhoods that put extra challenges on them as they grow up. I've written other articles about leadership, complex problems, collaboration, etc. over the past few years. Look at some of the past articles and use these as discussion starters in your own community, business and social network. Read about this Saturday's Halloween Bake Sale, organized by one of our Cabrini Connections students and her mentor. You can help make this Halloween special if you make a donation yourself. A full page feature story in today's Chicago Tribune is titled Quelling the wave of youth violence, and focuses on efforts by please and community organizers in the South Shore neighborhood of Chicago to try to reduce growing youth violence in the area. 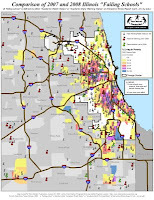 Below is a map of the South Shore area, showing levels of poverty, locations of poorly performing schools, and a few assets, such as churches, businesses, etc. 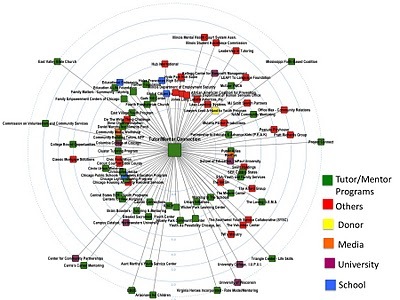 I created this using the Tutor/Mentor Program Locator. Follow these instructions and you can create your own map. Green stars on the T/MC maps are organizations we've identified that do some form of tutoring and/or mentoring in non-school hours. If you visit the actual program locator, you can scroll across the map and find names of organizations, and double click and go to their web sites. On this map, we see two programs: Fathers for the Future on 71st Street and Center for Community Development near 78th Street. Neither has a web site listed, so we can't tell much about what they do. The Chicago Youth Centers Rebecca K. Crown Youth Center is also in South Shore and they have a Mentoring Children of Prisoners program. There might be others that are not in our database, or it could be that more don't they don't exist. We depend on programs and community members to provide information to keep the program locator current. If you know of tutor/mentor programs in the South Shore, send us the information. Note: When you search for South Shore or the 60649 zip code using the program locator search screen, you get an error message. We know this. We're trying to find volunteers, or donors, to help us fix parts of this site that don't work. However, if the community does not have enough non-school learning, mentoring, arts and technology enrichment programs available in the nonschool hours, that motivate youth to want to participate, where else do they turn to for a feeling of belonging, and a network of peers. The purpose of the maps are to help people in a community come together to build and sustain a wide range of non-school volunteer-based tutoring/mentoring and learning organizations. 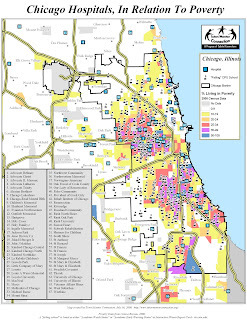 While there are none in this area, people in the South Shore can use the interactive Tutor/Mentor Map to look in other neighborhoods to see what types of tutor/mentor programs exist, and to learn ideas that they might want to duplicate in their own neighborhood. As an organizing group, this would be a great tool for the Chicago Police Department, or local elected officials to use. We're holding a Mapping Solutions event on Nov. 17 and a Tutor/Mentor Leadership and Networking Conference on Nov. 19 and encourage community, faith and business leaders from these neighborhoods to attend and find ideas for building and sustaining more non-school programs in their area. 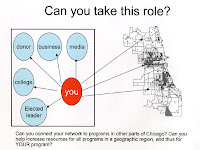 We're also looking for sponsors and donors to help us continue offer the Program Locator and Conferences to citizens and leaders of the Chicago region. We can't make this a free resource for everyone if we can't find a few benefactors and leaders to help provide the dollars it takes to build and maintain this type of an information system. Instead of trying to get millions of people in one room, to try to build a consensus, why not try to stimulate thousands of discussions in many places, all drawing from a common body of information and ideas? Browse the Tutor/Mentor Connection web site and see how this links you to a world of ideas that can be used to help kids in disadvantaged parts of the US and the world. With Waiting for Superman drawing attention to public education, I hope more people are doing some deep thinking about what challenges we're trying to overcome, and how difficult this will be. I would like to pose a couple of ideas that I hope will be shared. Which is more possible in the next decade? Improving the level of teaching quality and effectiveness at every high poverty community classroom of every public school in America, and maintaining this high quality for the 13 years from when a youth moves from kindergarten to high school graduation. Such teachers must be better than those who do not teach in high poverty because they need to overcome the lack of positive education role models and experiences provided by family and community in more affluent areas. Furthermore the need to be able to overcome the negative influences of high poverty which surround a child in from birth till entering school, and are constantly present in the hours when that youth is not in school as he/she moves from first grade through high school, and post high school toward a job and career. Creating a system of mentor-rich non-school supports that are available to at least 25% of youth in every poverty neighborhood, and which influence student aspirations, learning habits and motivation so youth come to school every day more prepared to learn. Such supports would include arts, technology, contact with adults who have college educations and work in jobs and careers not common in poverty areas. 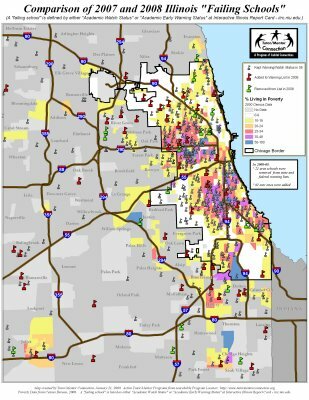 The map of the Chicago region shows where poverty is concentrated, and shows locations of poorly performing schools. Every classroom in every one of these schools would need a high quality educator to assure that the kids coming through that school would finish prepared for the next level. What are the marketing and human resource development, and funding strategies, that can get us to the starting gate of great teachers in every one of these schools? What is the marketing, leadership and commitment needed to keep such teachers in place for 10 or 20 years until the impact of poverty in the area of each school is overcome by better educated youth who become adults living and working in these communities? In each of these neighborhoods high quality non school programs such as Cabrini Connections are also needed. However, we may not need programs to reach 100% of the youth. There may be a tipping point where there are enough programs influencing the habits and aspirations of a strong minority or weak majority, but enough to tip the motivation scales an influence the learning habits of the rest of the kids in a school? Funding and leadership for non-school programs can come from local networks of business, philanthropy, faith groups, and government, while funding for schools has to come from a broader community, state, or federal level commitment to tax dollars. Is it possible that we can influence learning and prepare youth for adult roles more by changing what is around the school, than what is happening in the school? Is there a blend of these ideas where we focus on schools, and non schools, at the same time? Do any of you know a place where these two ideas are being discussed on line, where others can listen in, contribute, or add ideas? Visit the Tutor/Mentor Institute for more reflections from the Tutor/Mentor Connection on these challenges and potential solutions. Two or three times a week I post an article on this blog, or on the T/MC Ning site. Others from Cabrini Connections are also writing blogs, which you can see here. The goal is to create a chain reaction, as this graphic illustrates. I hope members of my board of directors, advisory council and volunteer base read these and then pass them on to other people in their own networks. The graphic below illustrates this. 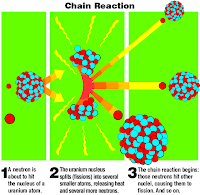 We aggregate information, and use these blog articles to provoke thinking and actions. Each time someone spends time reading these articles they are becoming more informed. Each time they encourage others to read them, they are expanding the network, turning more uninformed people into informed advocates. Just spend thirty minutes a week trying to take this role. It can make a difference. 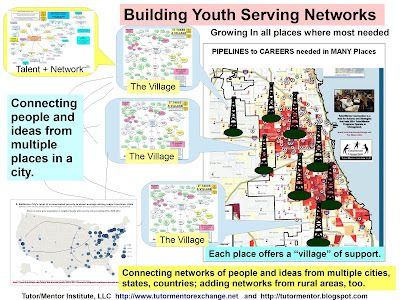 The graphic at the left is one of many I've created and posted on this blog, to illustrate that our goal is to help kids living in high poverty neighborhoods have support systems, including non-school tutor/mentor programs, that help them move to jobs and careers. In the complex problems tag you can find more than 70 articles. One of the most difficult problems we face is finding the time to reflect and think about these problems, or to maintain quality information about all of the organizations offering various forms of tutoring/mentoring in Chicago. This would be a significant task for a larger organization. 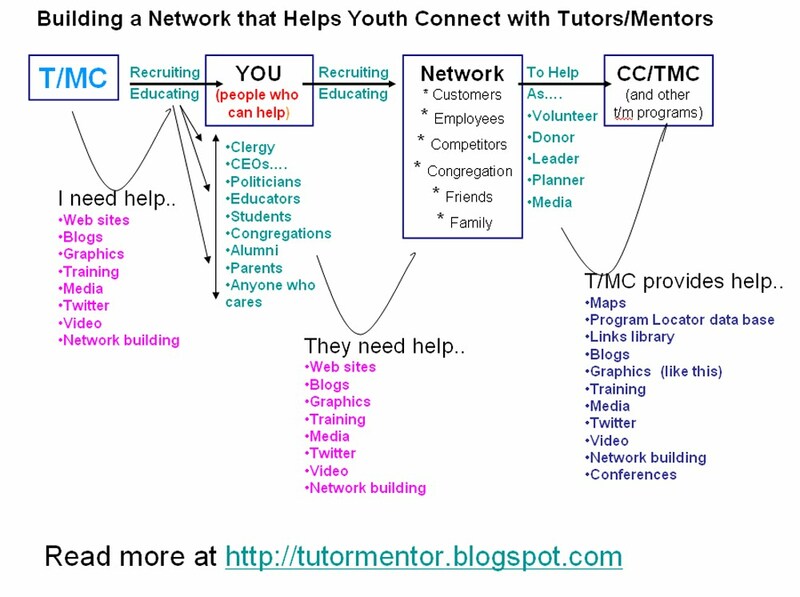 At the Tutor/Mentor Connection we have just one full time person, serving a one-year fellowship, focused on the T/MC. My own role as President, CEO of Cabrini Connections, Tutor/Mentor Connection means I divide my time between the T/MC, our own Cabrini Connections program, fund raising and administrative roles. Even if I work 60 hours a week, it's not enough. Thus, either we find dollars to expand the staff and capacity of the T/MC or we find partners in universities, businesses, other intermediary organizations, etc. who will share the role that we have adopted. Maybe we can do both. 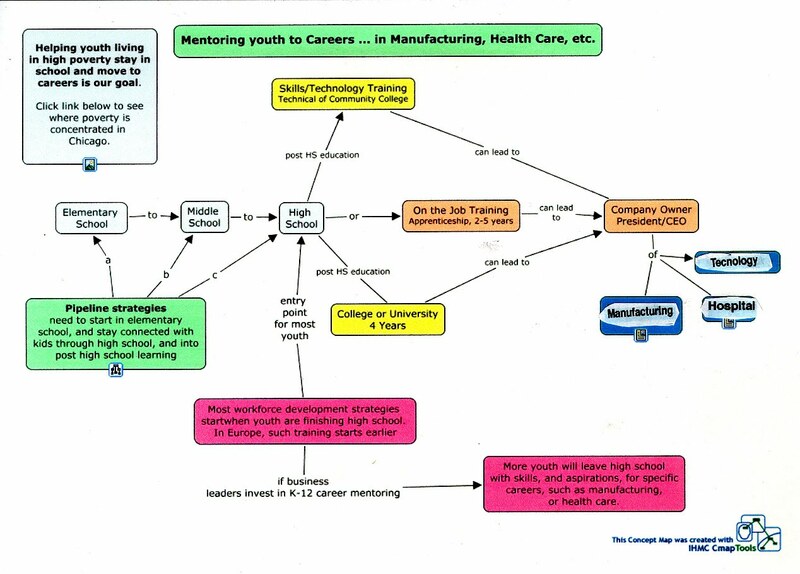 This graphic illustrates that my organization is not the only one in Chicago that wants to help kids living in poverty neighborhoods move successfully through high school, college and/or vocational school into 21st century jobs in area industries. 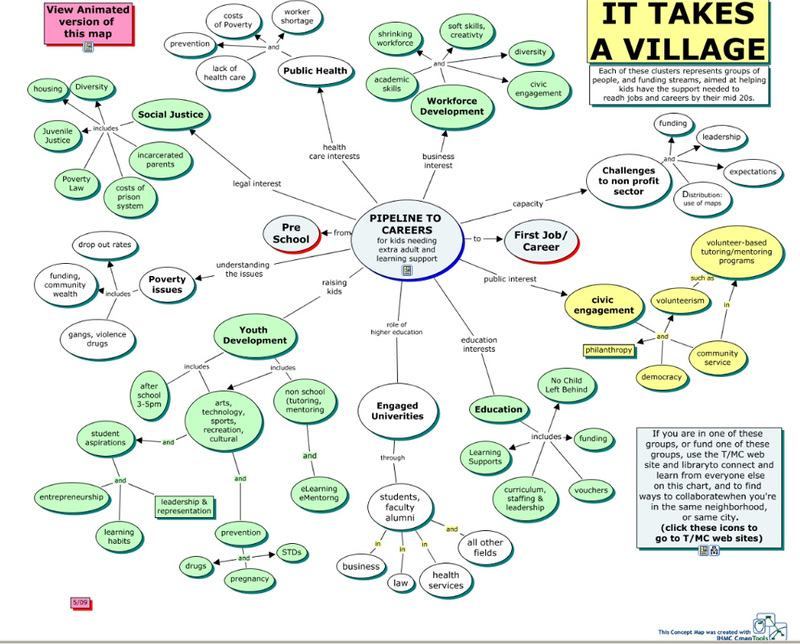 There should be think tanks in each of the clusters on this village map. T/MC and its resources should be available in each of these groups, just as the ideas from each cluster should be open and available to people who look at this problem from a different lens. How many people are even defining the problem this way? Who are you? Where are you? How can we connect? Who are the philanthropists who will bankroll this process? Where do poverty, violence, school performance and community support intersect? Our maps can show you. The Tutor/Mentor Connection (T/MC) is hosting a map gallery fundraiser, entitled Mapping Solutions to demonstrate ways that maps can be used by business, non-profit and political leaders. Mapping Solutions will be part of International Geographic Information Systems Day, (known as GIS Day) events being held throughout the world on November 17. 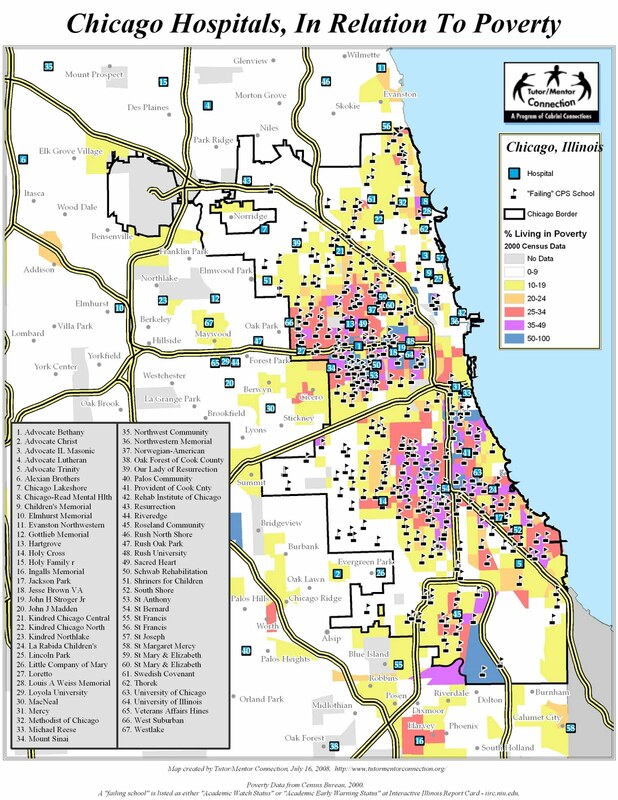 If you've read many of the articles I've written since 2005, you'll see how maps can be used to draw volunteers and donors to different parts of the Chicago region, where tutor/mentor programs are needed, and where these resources are needed. Help us find the resources to support this strategy. Bring potential sponsors or donors the the Mapping Solutions event. Visit this page to learn more and find sponsor and donor details. I just added a link to this New York Times article titled "Culture of Poverty Makes a Comeback" in the Social Capital Links section of the Tutor/Mentor Connection library. The article includes statements like "day-care centers that held frequent field trips, organized parents’ associations and had pick-up and drop-off procedures created more opportunities for parents to connect." Another statement was "a study by Professor Sampson, 54, that found that growing up in areas where violence limits socializing outside the family and where parents haven’t attended college stunts verbal ability, lowering I.Q. scores by as much as six points, the equivalent of missing more than a year in school." However, the term social capital was not mentioned. If tutor/mentor programs expand learning opportunities and exposed kids to people who model college, careers, and other aspirations than what is modeled in high poverty neighborhoods, shouldn't such programs be consistently supported by donors who believe in the power of these programs as a form of "bridging social capital". Take a look at the web site of some of the tutor/mentor programs in the Chicago program links. If you see a wide range of volunteers and learning experiences, you're seen an example of intentionally building social capital. Look for the "donate" button on the web sites that demonstrate this and support them as your own commitment to overcome the "culture of poverty". 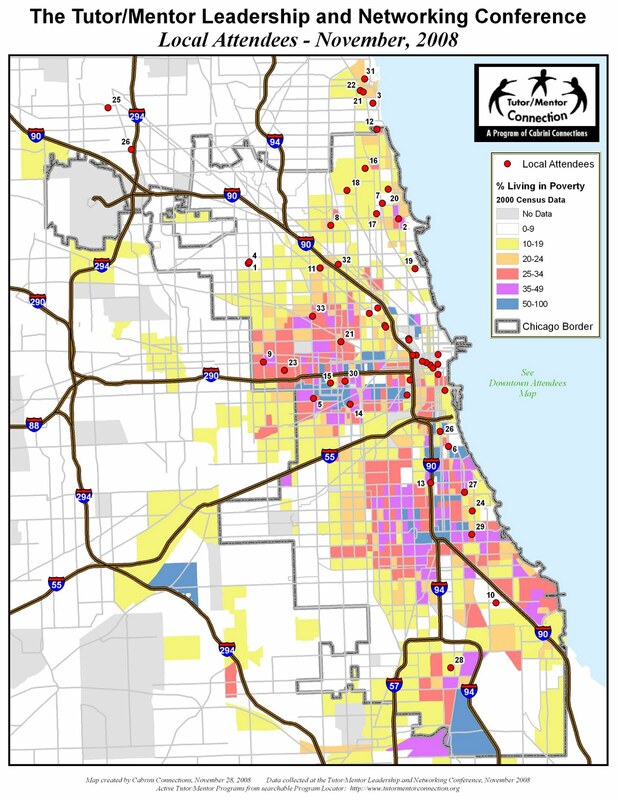 This fall an Explore Chicago class at DePaul University is learning about the gaps between rich and poor in Chicago, and the availability of tutor/mentor programs in different neighborhoods. As they learn, they are sharing this information on blogs like this one, which talks about tutor/mentor programs in the Austin area on the far West Side. Another group talks about the far South Side, and another talks about the South Shore area. You can also read about the Near North, the Northwest Side, and the Southwest Side of Chicago. I've written about roles universities and their alumni could take in helping tutor/mentor programs grow in different parts of the city and suburbs. Imagine if the marketing, journalism and even one or two fraternities from each university duplicated this as an on-going project. Over a period of years their understanding of tutor/mentor program need and availability would become more sophisticated than that of most leaders in the city, and their ability to draw resources into the neighborhood to help each program grow would also surpass that of any current elected or business leader. Even high school students could take on this role. Instead of being a victim in a poorly performing school, students could be leaders and advocates demanding that the adult world deliver the resources that are already available to kids in other neighborhoods. If you take on a project like this, and use the Tutor/Mentor Connection as a resource, like the DePaul class is doing, just let us know so we can coach your progress the way we're doing with the DePaul group, and with other interns and volunteers who are writing about tutoring/mentoring and the T/MC on the T/MC Ning Site. Don't Wait. Be a Super Hero yourself. Today's Chicago Tribune editorial encourages people to see the Waiting for Superman movie, and then advocates for more charter schools. This video shows that volunteers can connect with inner city youth in organized, non-school tutor/mentor programs. It also shows that volunteers can donate the money that makes these programs possible. This is just one video you can see on the Cabrini Connections site. Cabrini Connections is just one of the youth serving organizations you can find in the Tutor/Mentor Program Locator. Visit the Cabrini Connections, T/MC Fund Raising page and see ways you can become a super hero by helping us connect inner city youth and volunteer tutors/mentors. 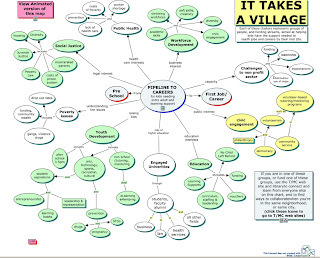 This map was posted on Mapping for Justice today by Mike Trakan of the Tutor/Mentor Connection. 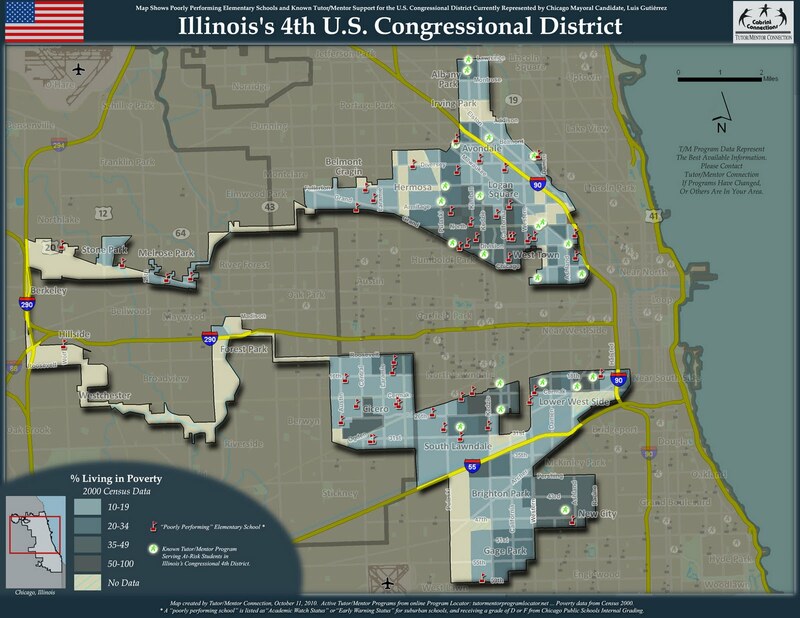 It shows the Illinois 4th Congressional District, which has been represented by Luis Gutiérrez. 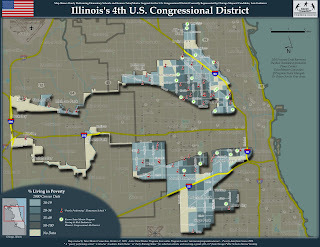 Note how this wraps around the 7th District, held by Congressman Danny Davis (see map here). 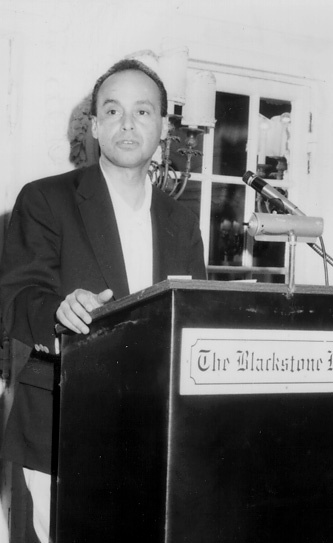 Congressman Gutiérrez was a guest speaker at the spring 1999 Tutor/Mentor Leadership and Networking Conference. Congressman Davis has also attended a T/MC conference. So did President Obama. 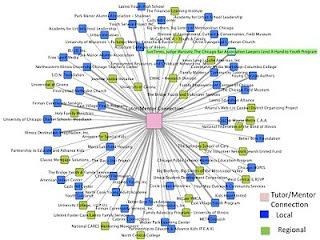 Unfortunately, none of these leaders have ever provided financial support to help the Tutor/Mentor Connection create these maps, host the tutor/mentor program directory, and host the conferences. We don't know if they have used the maps to mobilize resources for their districts either, though I've given the maps personally to Davis. If you are trying to raise kids or do business in these districts, what does this say to you? As we think of who should be the next Mayor of Chicago, what does this say? When you look at T/MC maps, look at where there are concentrations of poverty and poorly performing schools. Are there non-school tutor/mentor programs in these areas? You can use the interactive map and program locator on the http://www.tutormentorprogramlocator.net site to find contact information and web sites for the tutor/mentor programs we list (if the organization has provided that information). Thus, you can compare one program to another, and build your own understanding of "what is a good program" and "what can you, your business, or your church, or your elected leaders do to help good tutor/mentor programs be available throughout a political district. 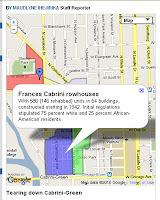 Look at Mike's blog, or the maps tag on this blog, to see how maps can be included in social media stories. Kids in local high school could be doing this. So could planners in local companies. We're looking for donors and sponsors to help us keep this service available to Chicago and will be holding a Mapping Solutions event on Nov. 17 at Webster Wine Bar. Click here to find details and an address to send a donation. We'll also be showing ways to use these maps, at a workshop during the Nov. 19 Tutor/Mentor Leadership and Networking Conference. Be a sponsor for the conference, or Mapping Solutions, and you can help the T/MC keep its services available to Chicago. See the network analysis maps showing how these conferences are bringing hundreds of organizations together each year. The Waiting for Superman movie is in Chicago theaters. I hope you're talking about it and that you've visited the web site to see how you can get involved. If you visit the Chicago page, you'll find the Tutor/Mentor Connection is listed as a resource. Most of the other resources listed focus on fixing schools. We focus on making non-school volunteer-based tutor/mentor programs available in high poverty neighborhoods, so there are more people helping families and schools in high poverty neighborhoods. We also point to an extensive reading library, with links to research, articles, blogs, and more that help learners understand the complext issues behind poverty and poorly performing schools. In the Chicago Tribune today, an article titled "Stone Cold Silence" illustrates one part of this problem. Too many kids who grow up to commit or be victims of crime, are kids born out of wedlock, and raised by a single parent. The writer, Heather McDonald, says "The enemy" attacking Chicago's young people is not a nameless force but something quite specific: the disappearance of paternal responsibility. She concludes with "At the margins, mentors and social workers can give fatherless boys a better chance of growing up to be law-abiding, stable adults, if those mentoring programs are infused with the kinds of masculine virtues promoted by the Boy Scouts." 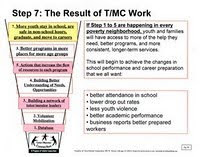 Improving the learning opportunities and preparing more of our young people for 21st century jobs and careers, especially those living in high poverty area, is a hugely complex problem, just like changing the social habits that have led to so many fatherless children. As important as these problems are, solutions that reach even a fraction of communities are a long way off. 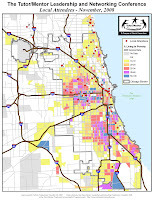 However, expanding the network of out-of-school adult support and learning opportunities for inner city kids can be achieve, for a growing minority of children, with the availability of programs like Cabrini Connections, Midtwown Education Foundation, Family Matters, WITS, and many others that we list in the Chicago Program Links on the T/MC Web site. In each of these program kids are enrolled right now. People from business, faith groups, colleges, philanthropy, etc. can look at the way existing programs are organized, and create new programs in areas where none exist. It only takes a commitment of a few dedicated people, and the commitment of a legion of donors and volunteers. Let's look at Superman and work toward changing the world, but let's also look at the super men and women who lead the non profits offering tutoring/mentoring programs, and help them get the dollars and other resources each program needs to stay in the lives of the kids who already are part of these programs. We can always look at the future and gain a crowd. It is harder to look at what we can do today, and what actions we can take, that can have a more immediate impact, and may contribute to the long term solutions. Poverty grows in suburbs. New report. "Analyses by the Brookings Institution paint a bleak economic picture for the 100 largest metropolitan areas". That's the breaking news from WGN/CLTV/ChicagoTribune news center. 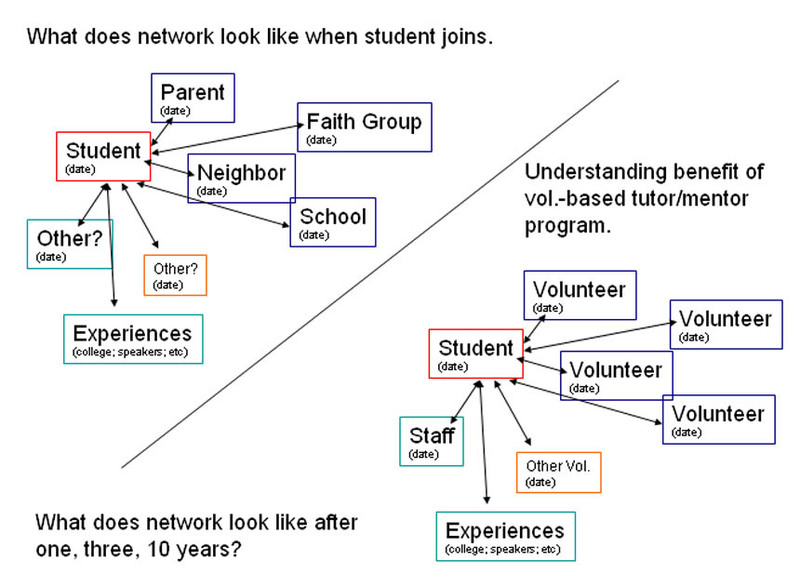 The Tutor/Mentor Connection has been using maps to illustrate this point for several years. Our aim is to mobilize leaders, volunteers, donors, etc. to help support existing tutor/mentor programs in all high poverty areas, and help new programs grow where maps show that none now exist. On Nov. 17 we will be hosting a Mapping Solutions event at Webster Wine Bar in Chicago to demonstrate this use of maps and enlist more business leaders to support our efforts, and adopt these into their own efforts. Right now we don't have good information on tutor/mentor programs in the suburbs. Thus, if you know of programs that are not listed on our maps, just contact the T/MC so we can add them. The better the information, the more people will use these to support the growth of needed services in areas where poverty is expanding. The November Tutor/Mentor Leadership and Networking Conference will be held on November 19 at U.S. Cellular Field. Visit the http://www.tutormentorconference.org web site for details and to find ways to participate. 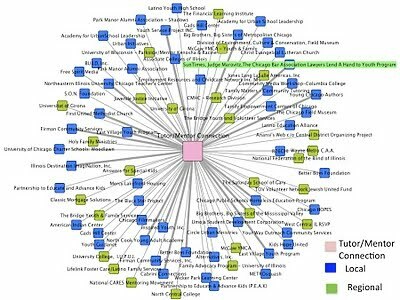 This map shows organizations that 1) attended May 08 conference 2) attended Nov 08 conference and 3) attended both May 08 & Nov 08 conference. You can see more maps like this here. This video shows how participants value these conferences. We hope you'll join them. 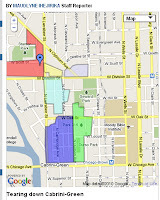 This map shows neighborhoods of Chicago where participants from the November 08 conference came from. 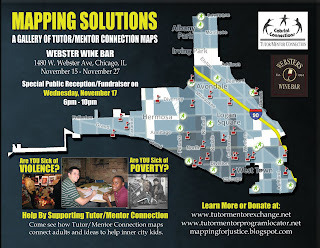 On November 17 as part of International GIS Day, the Tutor/Mentor Connection will host a Mapping Solutions event at Webster Wine Bar in Chicago. We will showcase maps as art, and show how they can be used by leaders to distribute resources to tutor/mentor programs in different poverty neighborhoods. These maps show how Tutor/Mentor Connection is trying to help kids in every high poverty neighborhood connect with tutors/mentors in well-organized, non-school programs. However, we're a high poverty non-profit and we need your help to increase the dollars we have to host the conferences, produce the maps, and help connect leaders of tutor/mentor programs to each other. Please become a sponsor of the conference, or make a donation to support Mapping Solutions. Or send a general donation that we can use for these events, and to operate the Cabrini Connections program that is the basis for our experience and commitment. Tutor/Mentor Connection (T/MC) organizes leadership and networking conferences in May and November every year to share resources and information with organizations involved in tutor/mentor programs and organizations supporting these programs. Describing the impact of the conference, and attracting sponsors to help market these to a growing number of participants, has always been difficult for the T/MC. In the past year volunteers have been mapping the participation, as part of a Social Network Analysis project. This graphic shows a geographical distribution of organizations that attended the Nov 08 conference. See this map and more in the blog article written by Kalyani Misra. Join our SNA discussion group and add your own time and talent, to this project. Organizing these conferences has always been difficult, because of the lack of funding for the Tutor/Mentor Connection. In the past year it has been even more difficult. We're close to setting a date for a one-day event in November 2010, which will focus on what we can all do over the December 2010 to Nov. 2011 period to strengthen volunteer-based tutor/mentor programs in Chicago and other cities. If your company or foundation can provide dollars to support this network building, please visit this sponsor page, or call the T/MC at 312-492-9614. Are you a fan? Support a tutor/mentor team. El Da'Sheon Nix, leader of the Cabrini Connections program, is a former football player at Northwestern. Thus, he knows how important the fans in the stands and the boosters are to success of the team on the field. Read his recruitment message and help if you can. While the Waiting for Superman movie is drawing attention to public and charter schools, non-school tutor/mentor programs can provide immediate extra mentoring and learning support, if they are available and if they are well-supported by fans and boosters. 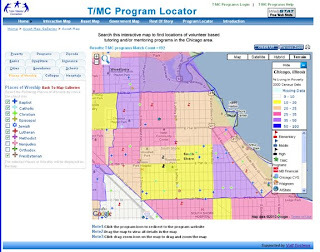 Use the Tutor/Mentor Program Locator, provided by Cabrini Connections, Tutor/Mentor Connection, to find contact information for tutor/mentor programs in different parts of Chicago. Your donations help us provide the Cabrini Connections program, and the Tutor/Mentor Connection's services. Michael B. Romain is a volunteer with the Tutor/Mentor Connection. He spends time looking at the information we share, what our goals are, and then shares what he is learning on a blog hosted on the Tutor/Mentor Connection forum. Yesterday he posted a commentary on the Waiting for Superman Movie that I encourage you to read. Michael is one of a growing number of people browsing the Tutor/Mentor Connection and Cabrini Connections web sites, and writing articles reflecting their own understanding. 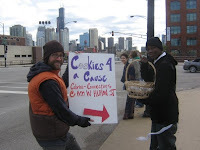 Visit this blog and see how students from DePaul University are involved. Waiting for Superman tickles the surface of a very complex problem, which is different for kids living in huge urban school districts with large numbers of people living in segregated poverty neighborhoods than for people living in smaller, and more economically and socially diverse communities. Unless significant time is spent understanding the problem, the solutions will just be superficial.